Several weeks after my grandpa died, my mother, younger brother, aunt & nephew went to go see grandma & i stayed home. My uncle & 3 year old nephew moved in with grandma after grandpa died, they live in her house. Well when my mom & brother came back, my brother came to me and said they saw grandpa & had a picture to show me. 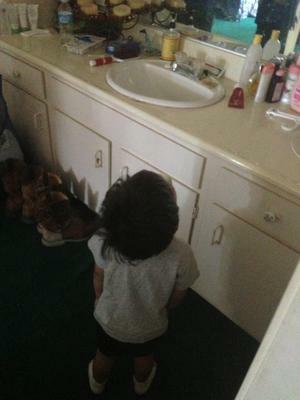 I was skeptical but when i saw the picture i got goosebumps and watery eyes, i couldn't believe it, this picture change my life, my brother told me that my nephew the one that went to visit heard my 3 year old nephew crying, my 3 year old nephew was sleeping in grandpas bedroom, so they went to check on him, and found my 3 year old newpew staring at the mirror, they found this strange & took a picture of him & when they examine the picture closely they saw a grandpa.